For thousands of years, humans have domesticated and trained dogs to perform tasks for them. Humans have developed areas of study, such as Applied Behavior Analysis, which aim to improve the training process. We introduce a semi-autonomous, canine-training system by combining existing research in Applied Behavior Analysis with computer systems consisting of hardware, software, audio, and visual components. These components comprise a biohybrid system capable of autonomously training a dog to perform a specific behavior on command. 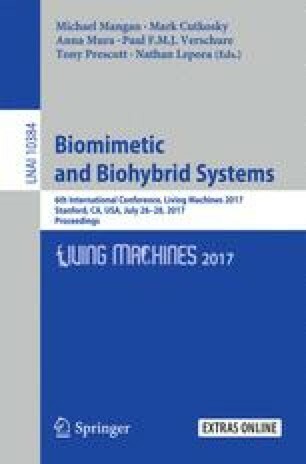 In this paper we further our previous computer canine-training system by the application of stimulus control over a newly-acquired, free operant behavior. This system uses light and sound as a discriminative stimulus for the behavior of a dog pushing a button with its nose. Indications of simple stimulus control of this behavior were achieved. Our pilot of this system indicates canine learning comparable to that from a professional dog trainer. We would like to thank Bob Bailey and Parvene Farhoody for input into the experimental design. We would like to thank Wes Anderson of Smart Animal Training for early access to the Pet Tutor dispensor. We would also like to thank Paws4Ever dog sanctuary for the use of their facilities, for access to their dogs, and to their volunteers. This work is supported by the US National Science Foundation under the Cyber Physical Systems Program (IIS-1329738).